A timeless classic and so easy to make! 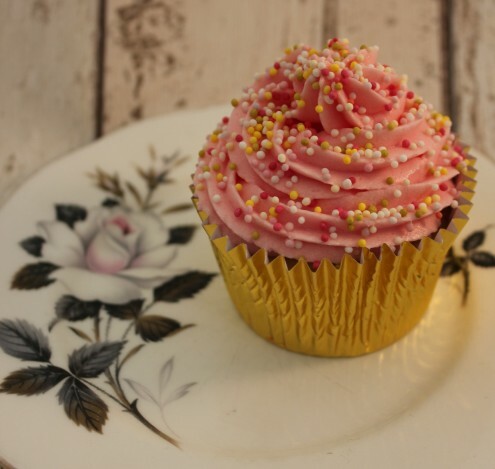 These Vanilla Cupcakes are made using the basic weight ratios of the Traditional Victoria Sponge – essentially the weights of butter, sugar, and flour should be equal to the weight of eggs in the mix. For these Cupcakes, I have used 3 large eggs, which most often weight around 170g. Try weighing your eggs first and see if I’m right! Match your weights to this weight and I promise you the lightest, fluffiest, best sponge you’ve made. Add the vanilla extract and a little milk (if required) to make a dropping consistency. “Use the best quality Vanilla Extract that you can afford for anything vanilla-flavoured. Decorate with Classic Vanilla Buttercream or Cream Cheese Frosting and plenty of sprinkles! Or why not try tying this little gift up with a Sugarpaste Bow?